I read books. You may read books. Every character in a book has a backstory. It's there in the shadows. I search for that backstory. I read between the lines so you don't have to. 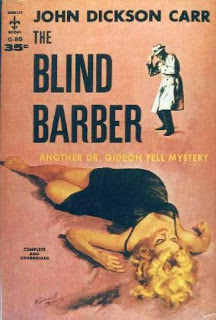 Today's victim book is The Blind Barber by John Dickson Carr. 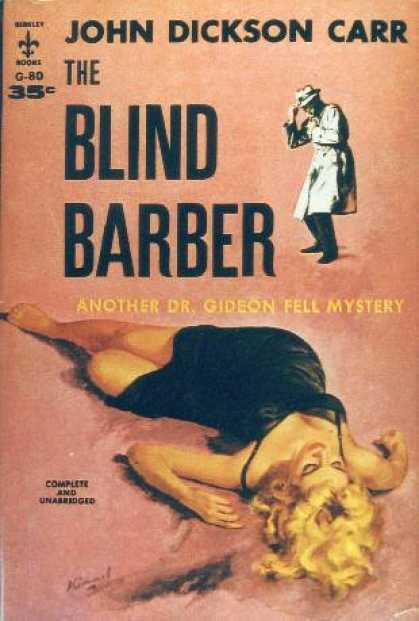 First published in 1934, it is part of his Dr. Gideon Fell series. But enough about Mr. Carr and his dubious Dr. Fell. I'm here to read between the lines. To find the backstory. To find the roots behind Edna's tragic end. In her childhood, Edna was like any other kid. Wholesome farm living kept her cheecks rosy and her body lithe. And so much to do! Living on the farm, there was plenty of room for running, playing, spying on animals in heat, and jumping around. Autumn was an especially joyful time of year around the farm. 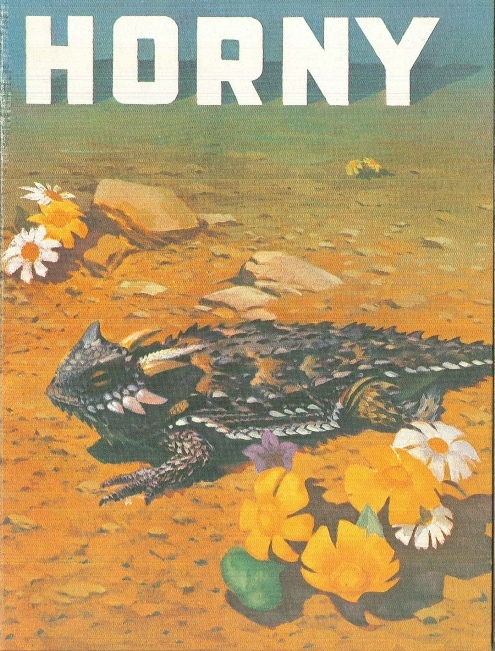 The fertile fields were ready to offer up their bounty. And the bounty was reaped. And there was rejoicing. Wagons brimmed with grain, groaning under their loads. Nearby, an auger stood proud and tall against the sky. Next to it, the grain bin opened wide, ready to receive the grain, to relieve the wagons of their contents. Edna was fascinated by the process. The grain swirled up the tube and spewed into the bin. An unfamiliar tingling consumed Edna. Her body begged to ride up and up to the sky. She wanted to ride up and be part of the powerful release at the top. Again and again. She wanted to fly. Up and up. Again and Again. She had no fear of flying. Suddenly, she knew for a fact that becoming one with the auger, the grain, and the bin was the only thing that would satisfy the growing need inside her. Up and up. Again and again. If she could not ride the wild auger, she knew the delicious tingling inside her would never be satisfied. And she wanted it satisfied. Her body begged for satisfaction. Up and Up. Again and Again. In a wanton act of need, she took her first step toward the grain wagon. Like jam slithering on top of peanut butter, she melted into the shadows on the side of the wagon. It was so right. It would be so good. She had to have it. Wrapping her tiny hands around the huge metal bars on the wagon, she hoisted herself up. Peeked over the edge. Her excitement grew as she saw soft grain waiting for her. It called to her. It longed for her as she longed for it. "Join us...join us," the grain whispered. "We are for you. No one but you. We will guide you as you writhe up the tube. We will join you as we gush into the bin. We will fly. Up and up." Edna hoisted herself to the edge of the grain wagon and, releasing her hold, let herself fall into the grain. It felt so good. Instinct took over as her arms opened wide and her legs splayed on top of the grain. She felt the grain shifting beneath her as they inched toward the auger. The tickle of the grain was a new sensation. A welcome sensation. Together, they moved slowly. Oh so very slow. Glorious waves of pleasure delighted her even as her need increased. Let it be slow. Let it speed up. Her back arched, as she squirmed and sighed. The pain, the pain. Pain unlike any other she had known. The tingling, the all-consuming tingling was replaced by the pain. When she awoke, Edna found herself in the hospital. All around her were doctors and nurses. The medical staff could not hide their sadness. Something was horribly wrong. Her legs. They were staring at her legs. Edna looked down. Her left leg. It was gone. It's another fine day at the 'ol biblioteca. Because I'm a conscientious librarian, I decided to go undercover today and learn about our customer experience. Under normal circumstances, I'd then use this information to find ways to improve our customer's experience in the building. Today, I was just enjoying walking around unsupervised. My first destination was the Teen Center. This is a magnificent place. Truly. 500 kids were jammed in there using computers, reading manga, watching movies, and flirting. Ah yes, the annual flirting ritual. Our Teen Center sees a lot of it. I wish to add that flirting, inside or outside the library is not limited to teens! There is a sense of dating-urgency around here in June. Anyone down here looking for a good time date, knows full well that the dating season is winding down. It's desperation time. Best get in a relationship now before all hell breaks loose in July. It's frustrating. But, stalwart desert rats that we are, Phoenicians find many ways to keep their hands busy in the summer heat. Staying in the solitary comfort of your home air-conditioning is a key survival skill for Phoenicians. After recovering from the inevitable rash I get when exposed to so many teen hormones at once, I wandered into the children's area. Give Booktender A Heart Attack. investigate the experiences the average customer might have up there. Note that I said average. What I found was a place jam-packed with our regular customers. Our regular customers are above average in many ways. They're also smarter than the dickens. How else to explain their ability to read with their eyes closed? And sit in comfy chairs all day and stay awake. Brilliant! By this time, my supervisor caught hold of me and sent me crashing down to the first floor where it was my turn to provide service at the Fiction desk. Our library is a place of wonders. Thought-provoking. Lively, in fact. Today, I was unable to go any further in my customer experience experiment. Despite my supervisor's best efforts, I vow to continue my study to the farthest reaches of the building. Stay tuned.